In the fall of 2013, Vid and I participated in the Virtual Archaeology: Museums & Cultural Tourism Conference. Organized by the University of the Aegean, the conference took place at the European Cultural Center in Delphi, Greece which brought together the museum groups from the world’s top museums, government officials on tourism, and leading digital archaeological teams like ours and Maurizio Forte’s team from Duke University to confer on the future interplay between these areas. 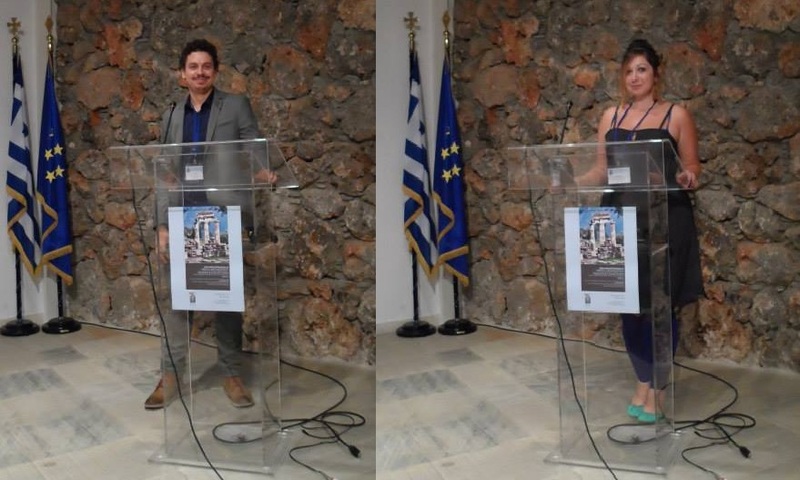 Vid Petrovic and Ashley M. Richter at the podium for the Virtual Archaeology Museums and Cultural Tourism Conference in Delphi, Greece. Given the forward moving thrust of technological advancement in diagnostic imaging, it is now conceivable to attempt to collect, collate, and visualize layered multi-media, multi-dimensional data sets which accurately digitally replicate an augmented experience of an archaeological site or other cultural heritage space. But like any venture, the data collection, and data processing are not without their challenges and successes. This paper explores the need for layered systems of mixed realities and the state of development for aspects of creating such a system with reference to data collection and processing conducted by the Center of the Interdisciplinary Science for Art, Architecture, and Archaeology (CISA3) at the University of California, San Diego. It will touch briefly on the testing of diagnostic imaging methodologies at archaeological sites in southern Jordan, including Petra. But will focus primarily on the layered visualizations draped over a central point cloud scaffold necessitated by the multitude of data sets, and the mixed realities of visual experience possible. As a case study, the visualization techniques developed to display cultural heritage data collected by CISA3 from the Palazzo Vecchio in Florence, Italy will be highlighted. Also: Check out the powerpoint presentation for the above on SlideShare. In storerooms and basements around the world- there are boxes upon boxes of archaeological artifacts waiting for the right person to come along and analyze them in the appropriate context. If there are so many physical artifacts already collected, what right and for what reasons should we- as cyberarchaeologists- be collecting new virtual “boxes” and “boxes” of data? This paper will explore the ways in which replicating space and time in a virtual context has extreme value for comparative visual analytics in archaeology and the potentiality for increased transparency and therefore citizen science for collaborative analysis and public engagement. But that in developing the interactive, multi-media mixed realities labyrinth which should exist to connect the one-off archival structures that function as our current digital repositories, and which are being designed by the Center of Interdisciplinary Science for Art, Architecture, and Archaeology –the means by which meaning is culled from the chaos must be ethically implemented with a provision for a multitude of biases. The ethics and the security of the cyberarchaeological data need to be considered as part of the design, data collection, and especially the visualization and dissemination process. Though the data transparency of digitizing the past provides a beautiful means to share it, it also provides new means for cultural heritage data to be misused in the political and social arenas and beyond. Tagged archaeology, Architecture, art, Ashley M. Richter, Center of Interdisciplinary Science for Art Architecture and Archaeology, CISA3, computer science, Cultural Heritage, Cultural Heritage Diagnostics, cyberarchaeology, Delphi, Delphi Museum, Digital, digital archaeology, engineering, Greece, technology, University of California San Diego, Vid Petrovic, Virtual Archaeology Museums and Cultural Tourism Conference, visualizationBookmark the permalink.